I just worked something out. I have always felt my wings coming from my shoulder blades as separate limbs – meaning, they don’t move when my arms move, they move on their own, so it doesn’t feel like my arms are wings, but like I have an “extra” pair of limbs. For some time, it made me think that maybe I was actually a winged humanoid, but then I realised I always felt more like a bird. It’s pointed out in the community sometimes that this doesn’t make sense if you’re a bird, because your wings would be your arms, so, why people don’t feel phantom wings in the same place as their arms? And, it didn’t reach my mind immediately, but, just now, as I was getting undressed to take a bath, I realised what was happening. I do have “arm wings”, or, wings that are attached to my skeleton like a bird would have them. They just move separately from my arms. Where the left line, the straight line, is the “human” leg seen from the side, and the right line, the angle line, is the phantom leg. They both start at the “o” (the hip), but after that, they move differently. And, because the right line, the phantom leg, is phantom, it can “be in the same place” on the hip joint as the “human” leg, because there is not physical flesh and bone to be in the way, but also, some parts of it move differently. But, this is not the same as having four hind limbs. It’s just that the body map has two different sets of ideas about where the hind limbs should go and how they should move. So, both happen at the same time. Where the “o” is the shoulder joint, the straight lines down are the arms, and the diagonal lines up are the (really badly drawn) wings. They are “attached” (in what way that something that is phantom can be attached) in the same place on my skeleton, but they move completely different. But, they are not supposed to be separate wings as well as my arms, or “back wings” really. 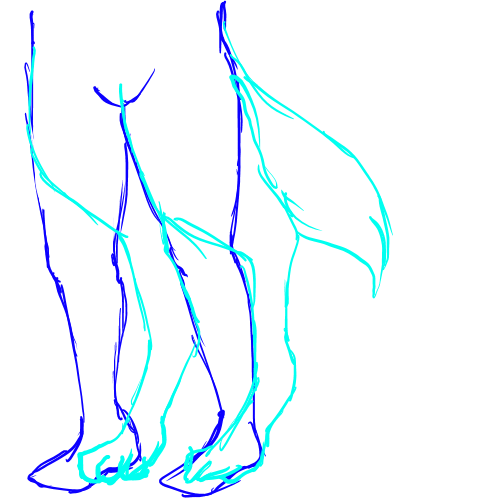 They are what should be there instead of arms, but because my arms don’t move anything the same way as wings would move, my brain rejects it, and moves the wings separately. So it feels like I have “arms and wings”, because my brain also does not reject the arms I do have, and so my body map says I have six limbs and four of them come from exactly the same two joints (and that can happen, because two of them are “alternate” versions of the other two). It’s like having two parallel universe versions of my self in the same body map, except that one is more human-shaped, and one is more bird-shaped. That makes a lot of sense actually, and does make me second-thought my own wings experience. I’ve always assumed I had separate wings from the arms, but I never really considered the fact there could be any other “option” than the single arm-wings to that. Mmmh. This is interesting.